Google’s Chromebook Pixel is an idea. It describes Google’s vision of a high-end laptop for citizens of a future world, freed from the encumbrances of old-style computer operating systems, existing entirely on the Web. The Chromebook Pixel is also a product, starting at $1299 (I reviewed the $1449 version, with 4G networking). It’s as solidly built and generously appointed as any laptop you’ll find, but it runs only the Chrome web browser, not Apple's Mac OS X or Microsoft's Windows. As an idea sprung from Google’s view of the future of technology, the Chromebook Pixel is intriguing, even intoxicating. But it’s hard to fathom how it works as a real-world product. If nothing else, it's reignited the Chromebook debate. Within the editorial team here, some editors wonder what the Chromebook’s point is, while others say that Chromebook’s critics are missing the point. Meanwhile, tech legend Linus Torvalds came out in favor of the Chromebook Pixel. Reasonable people are disagreeing, and thanks to the Pixel, Chromebooks are suddenly getting a lot of attention again. If the Chromebook Pixel is Google’s vision of what a laptop should be, the company has, if nothing else, proven it has good taste in hardware design. If there were an Apple logo on the top, nobody would be surprised. As a longtime user of Apple laptops, I felt right at home when I opened up the Chromebook Pixel for the first time. The Chromebook Pixel's brushed-aluminum design would fit right in at an Apple store. This is a solid, aluminum-bodied laptop. At 3.35 pounds, it sits between the 2.96-pound 13-inch MacBook Air and the 3.57-pound 13-inch Retina MacBook Pro. The Chromebook Pixel is dominated by its large, high-resolution display. It’s a bright, glass-covered panel, with a resolution of 2560 by 1700 pixels and a density of 239 pixels per inch (ppi). Like the Retina MacBook Pro (whose density of 227 ppi is imperceptibly lower), this is a screen so good that you simply can’t see the pixels. Photos are fantastically detailed, and text is crisp. The screen has an aspect ratio of 3:2, which makes it taller than most recent laptops. Given that extra height is more valuable than extra width on most web pages, it’s a good decision. The Chromebook Pixel's high-resolution display is so good you simply can't see the pixels. The display is also a touchscreen—a curious design decision given Chrome OS is still largely a mouse-driven interface. We’ve all become so trained in the gestures of touchscreen interfaces, however, that it’s become almost second nature to reach out and tap on a screen from time to time. As long as you’re reaching over a keyboard, a touchscreen is never going to be a primary input method on a laptop. But it’s a nice addition to the trackpad. When using the Pixel's touchscreen to swipe between images on the 500px Chrome app, I noticed that scrolling seemed laggy when I used my finger, but crisp when I used the keyboard. Part of this is, I think, psychological: When you move your finger, you expect the content underneath your finger to move along with it. But that's not all of it: When I touched an arrow key, the app scrolled to the next picture much more smoothly than it did when I swiped. The UI just wasn't measuring up. The overall experience left the touchscreen seeming at times surprisingly inferior to the keyboard. 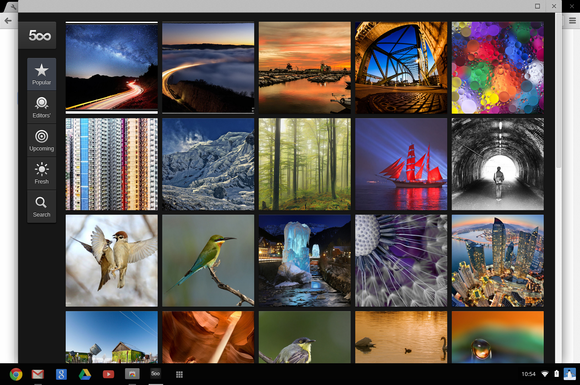 In the 500px app, moving through photos seemed faster using the keyboard than the touchscreen. The Pixel’s trackpad is a large black, glass multitouch model comparable to those found on Apple’s laptops, and its backlit keyboard is similarly Apple-like. There’s no standard set of function keys at the top, though--instead, there’s a bar of buttons used to control brightness, volume, and similar features. Ports are minimal. The Pixel has two USB 2.0 ports (not 3.0, sadly), a Mini DisplayPort for video out, a standard headphone jack, and an SD card slot. The higher-end Pixel is made for cloud-based computing. Consider the 64GB of solid-state storage to be just in case. Onboard storage is really not the point of this device, but it's actually hard even to find it in Chrome OS: Files is just another icon in the app dock. More important is the integrated 4G networking, which comes with two years of Verizon LTE service and 100MB per month of data. My Pixel connected to Verizon’s LTE network automatically whenever it couldn’t find a local Wi-Fi hotspot. With the exception of a couple of airplane flights I was able to use the Web anytime, anywhere. The $1299 version of the Pixel has just 32GB of storage and no 4G. As accomplished as the Chromebook Pixel’s hardware is, it can’t be judged on its own. The hardware works in concert with its software--in this case, Google’s Chrome OS. Everything in Chrome happens in a browser tab. Chrome OS is a bold move by Google to move beyond traditional operating systems. Everything--and I mean everything--in Chrome OS happens in a browser tab. Even hardware settings (such as shutting down wireless networking before boarding a plane) are controlled via a panel inside a browser tab. The idea here is that, for a lot of people, the Web is all that’s really necessary. If you’ve traded Word for Google Docs and Outlook for Gmail, you may find that the experience of using your computer has narrowed into one that’s almost entirely in a browser. Why not dump the rest of that junk and just embrace the browser? I love the sentiment, but I don’t think most prospective laptop buyers--especially prospective purchasers of a laptop as pricey as the Chromebook Pixel--will find that their lives are Web-centric enough to make the shift. 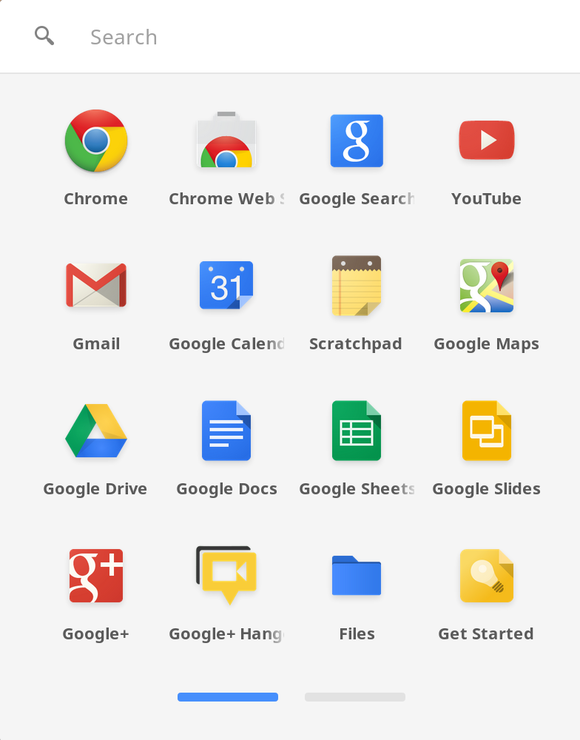 If all Web apps were as good as Google’s, there would be a stronger case. Spending a couple of days using Twitter’s website rather than a native Twitter client made me want to pull my hair out. 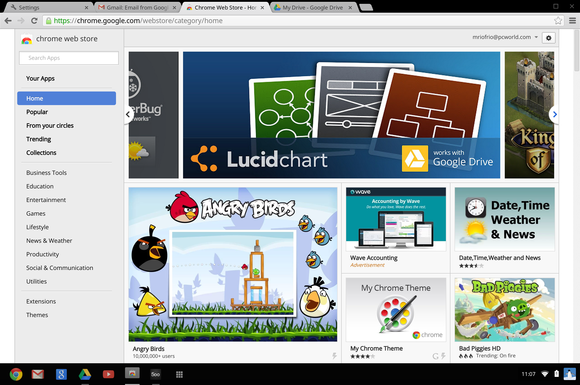 The Chrome Web Store is a melange of truly impressive native Web apps and glorified bookmarks. Chrome is a great browser, but Chrome OS shows a lot of gaps when it leaves its comfort zone. The problem is that some stuff just doesn’t work offline. If you’re never offline--never in a wireless dead spot or on an airplane or in a foreign country with incompatible wireless service--that won’t matter. Again, I’d wager that for most people this will be an issue, at least for a while. Chrome is a great browser, but Chrome OS shows a lot of gaps when it leaves its comfort zone. Usability would be improved by better window management. Chrome OS has a nice dock where you can pin frequently used apps, but it doesn’t really work right. If I’ve got a Gmail tab open and I click the Gmail button on the dock, it opens a duplicate tab. Chrome OS supports separate full-screen workspaces for different apps, but it’s got to be managed manually. I felt like I was doing a lot of unnecessary work moving tabs around to where I wanted them to go. Chrome OS has a nice dock where you can pin frequently used apps, but it doesn’t really work right. There are also places where the browser heritage shows through a bit too much. There’s a little Scratchpad app that’s built so you can quickly type in a few notes. It looks like its counterparts on Mac and Windows, but my right-click brought up a “Back” contextual menu that didn’t make any sense, and when I closed the Notes window, I repeatedly received a warning that “closing this tab” might make me lose data. It wasn’t a tab, and I didn’t lose any data. Pay no attention to the browser behind the curtain! The Chromebook Pixel is as well-built a laptop as you'll see. The body is solid, and the screen is something to behold. The Chromebook Pixel is a sleek, exciting iteration of Google's vision of the future of computing. And it's incredibly expensive. The problem is in the price and the operating system. At roughly the same price, you can buy an Apple laptop or an Ultrabook PC that provides roughly the same specs, runs Chrome, and also runs your favorite computer operating system with apps and games and Dropbox syncing and everything else you've come to expect from a laptop. As the resident of a stripped-down laptop offered for a stripped-down price, Chrome OS makes some sort of sense, but on a high-end laptop such as this, I have a hard time seeing who would want one. Sure, there are users who have completely embraced the Web and simply don't need the hassle of OS chrome and security updates and the like, but how many of those people are in the market for a laptop whose cheapest version is $1299? As an idea, Chromebook Pixel has a lot going for it. It's an iteration of Google's vision of the future of computing, and it's sleek and exciting. But as a product, it's just not practical. There are better laptops and cheaper laptops and better, cheaper laptops. The Chromebook Pixel augurs days to come, but in the present it's just an expensive curiosity.